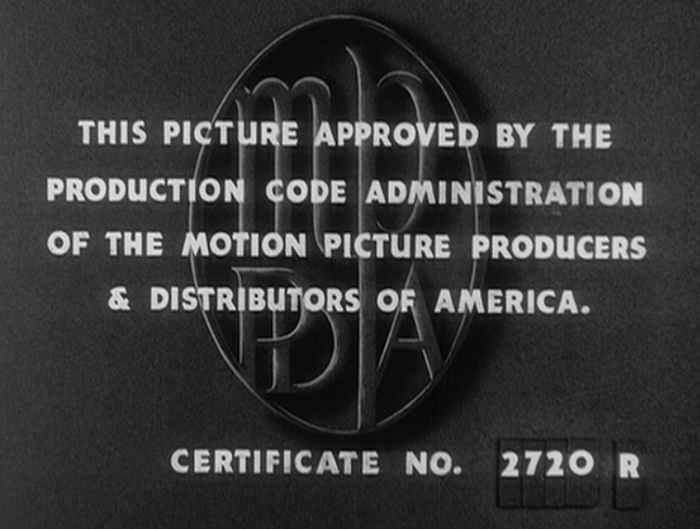 This is the seal of approval by the Motion Picture Production Code. 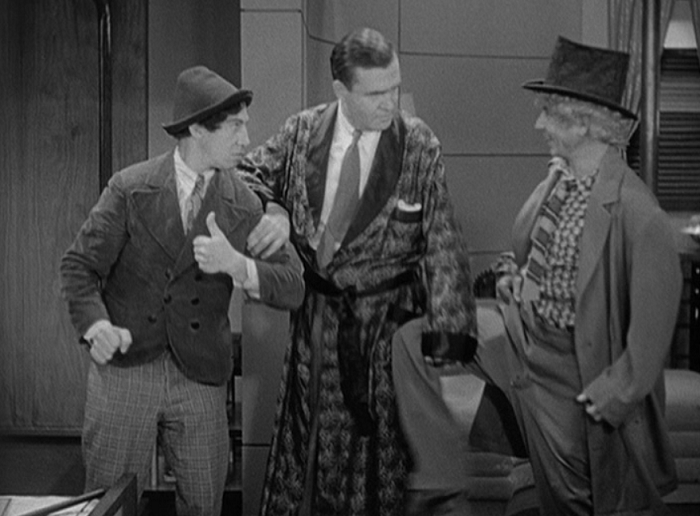 For those of you who’ve investigated this site or knows what Pre-Code is, this may not require much of an explanation, but you’re getting one anyway: any version of Monkey Business or any other Marx Brothers film from their stint at Paramount is censored. The screen I’ve got above is from when the film was reissued and the cuts were made. 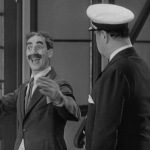 Back in the day after the Production Code was enforced, if a studio wanted to re-release a film (which was the only way to make any money on it), it would go through the Production Code Administration. Those with no or minor adjustments would have offending footage excised would be passed, those whose contents were too risque (see Baby Face or Search for Beauty) would simply be put back on the shelf. In an ironic way, being excessively immoral paid off since those films never had footage removed and lost forever. 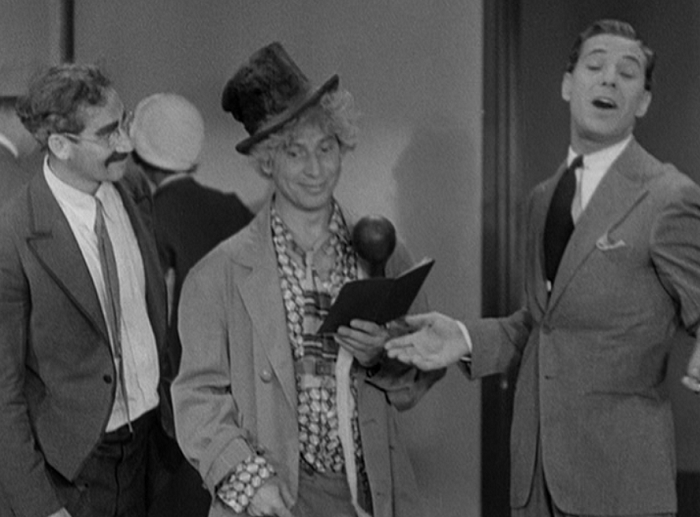 Unfortunately, the Marx Brothers were always a popular commodity, so the version you are watching is shorter than its original release. There are a few staggered cuts, and a number of lines removed. 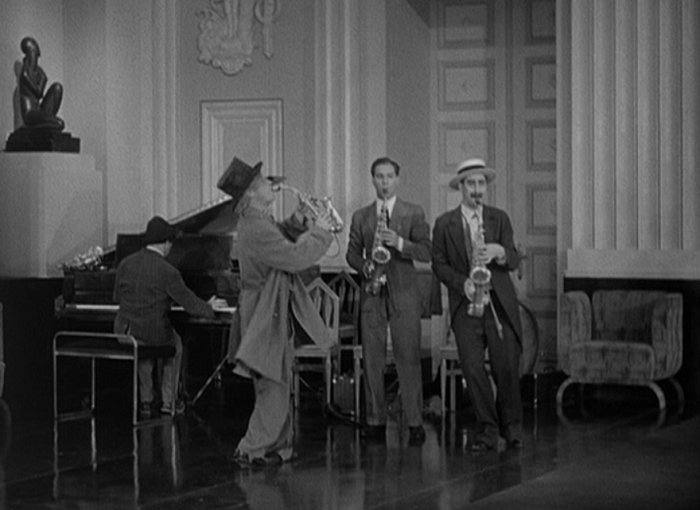 Whenever you see this stuff in the Marx Brothers movies, it’s important to know it’s not shoddy film making, but lousy censorship. 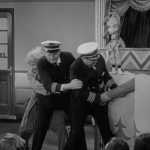 Now let’s make it clear: I don’t think the footage removed from Monkey Business added back in would immediately make it a good movie; it’s only a few lines, and it doesn’t make up for the fact that the movie’s structure is so top heavy it’s a wonder that the ship featured at the beginning doesn’t completely topple over. 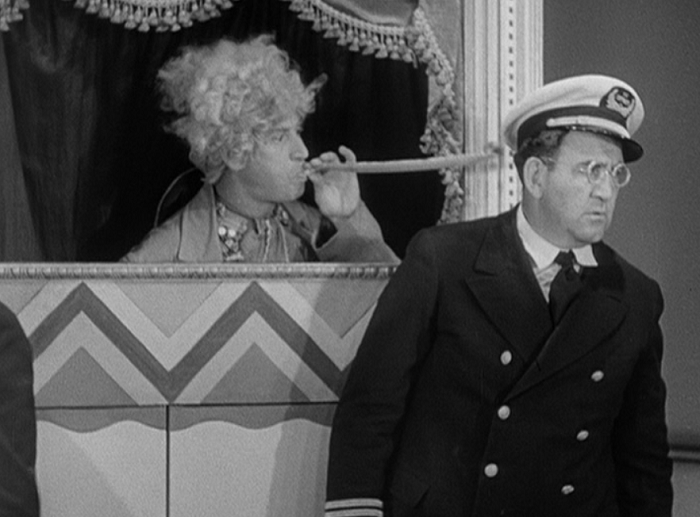 Here’s the setup: the four Marx brothers are stowaways on an ocean liner. They’re not given any names, but fumble around the ship trying to evade detection. 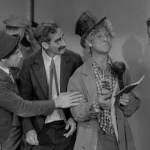 This last for about thirty minutes until the brothers find themselves involved in a war between two mafia bosses, with Zeppo and Groucho on one side and Harpo and Chico on the other. 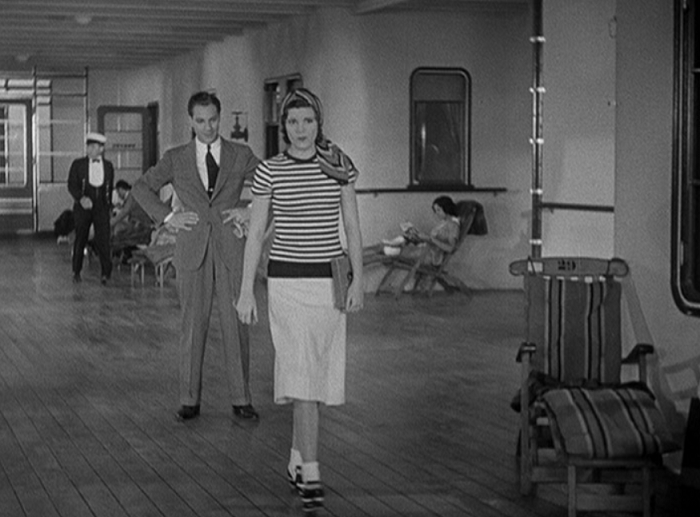 Zeppo is in love with one of the boss’s daughters, and at a dinner party after they escape the boat, she is kidnapped and they must all team up to rescue her. 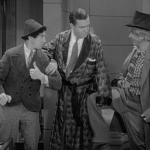 The plot is usually considered beneath discussion in Marx Brothers films, and while there are certainly a few where it simply functions as a clothesline, this one is pretty frayed. 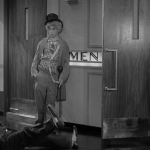 After the initial mayhem of the films first thirty minutes, momentum grinds to a halt and many of the film’s gags in its second half fall flat. 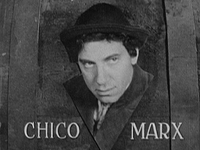 I think it should be a rule that you can tell how bad a Marx film is based on how close to the end Harpo’s serious musical solo arrives. SPOILERS until the next section head. Skip at your leisure! 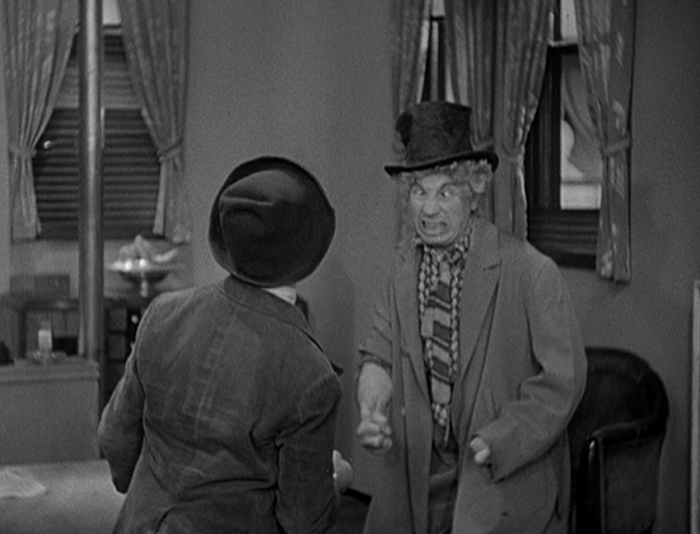 Besides the momentum simply dying after their successful escape from the ship, the film’s climax involves Zeppo and a thug involved in a fist fight. Rather than join in, the others stand to the side and either add in commentary or sit nearby making funny faces. 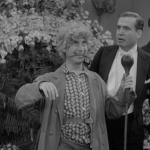 Putting Groucho, Chico and Harpo on the sidelines and so flippant during the climax makes them seem callous, and sours the last act of the film further. 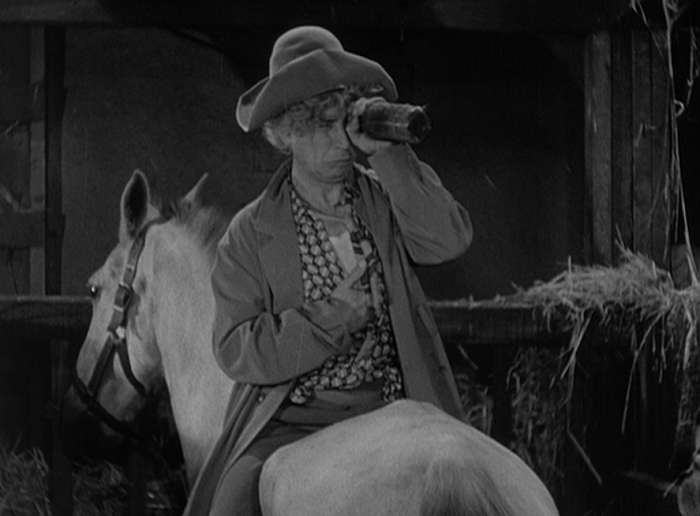 They’ve become observers in their own film, and their commentary essentially goes a step further to mocking the audience for any interest they may have in seeing the end of the film. 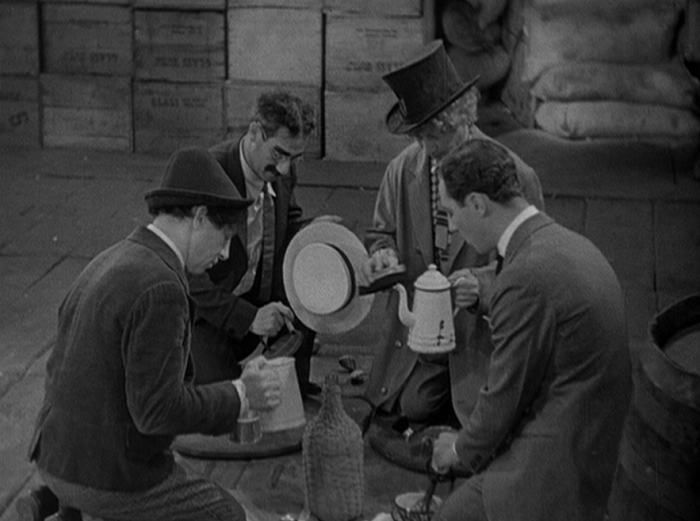 It’s a very Marx Brothers thing to do, considering the nihilistic notes that their next two films (Horse Feathers, Duck Soup) would also end (or attempt to end) on. It’s also not as heavy handed as the other films and is mocking institutions rather than people. Here we are merely mocking narrative structures, and those are a bit harder to separate from one’s perceptions than politics or college. 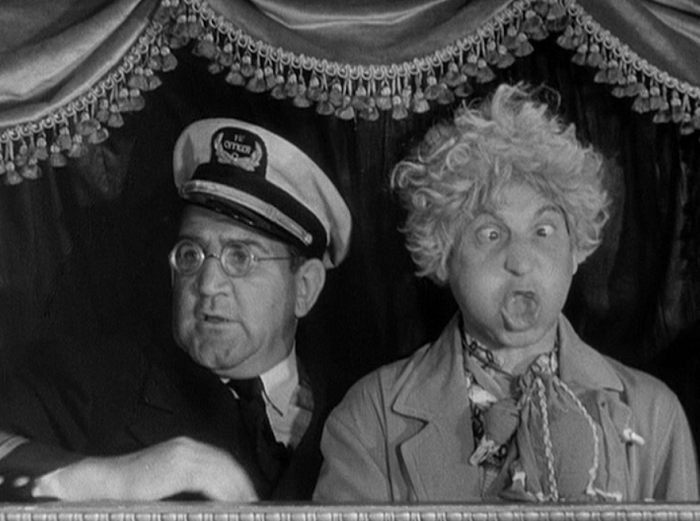 It’s also why I think this is the weakest Paramount Marx film after Cocoanuts; for all of the film’s playful hatred of its own construction, it’s still a victim of it. 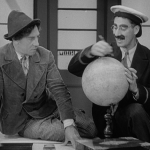 While I enjoy laughing with the Marx Brothers, the point at which they turn on their own movie is a path I couldn’t follow them down. It’s a shame that Cheveliar impressions have gone out of style. 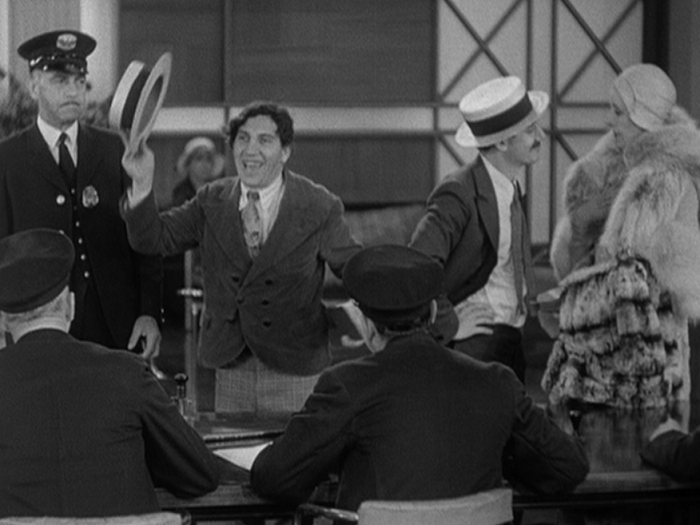 The most noticeable feature in Monkey Business may be that this is the rare time that Zeppo has been drafted to have his own character arc. 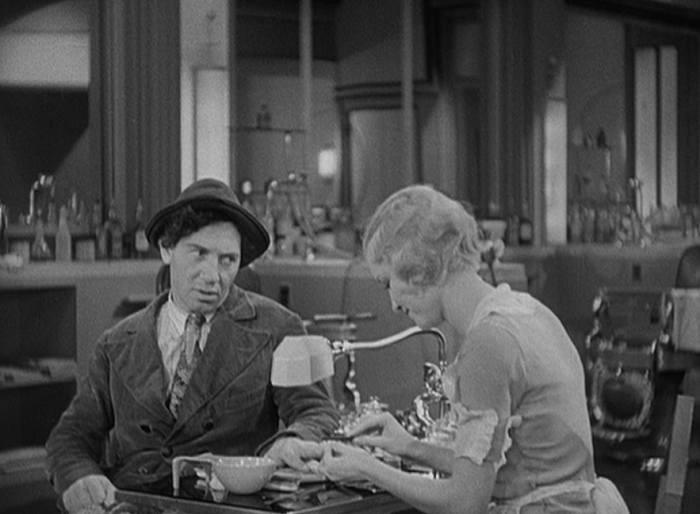 Often derided as the spare (and he would be excised by the time the troupe joined with MGM in 1935), I’ve always found a strange innate enjoyment in Zeppo. 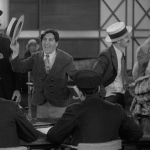 Zeppo’s appeal isn’t that he’s the straight man– in fact here he often gives as good as he gets. 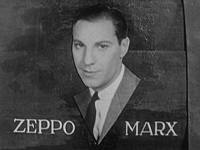 Rather, I’ve always liked Zeppo because he’s the bridge between the other three Marxes and the reality of the world they inhabit. He is perfectly in tune with the brothers in ways that none of the other romantic leading men paired up would ever be, but still understands those outside of the group that the others simply can’t. 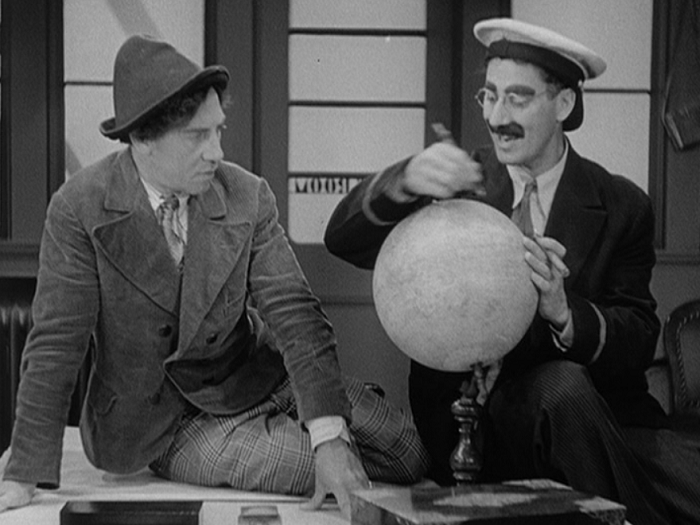 The tragedy of Zeppo is that he’ll never escape the Marx world to the real world. This is his biggest plots in a movie since he actually gets to do the romancing, and the film still ends with the other Marxes making fun of him and letting him go at the film’s antagonist on his own. He’s a Marx, he’ll never be anything else. But, hey, he seems okay with that. 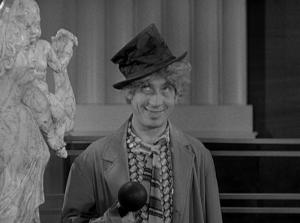 Zeppo’s go with the flow attitude is another one of his better attributes. He solidifies his brothers into their world; I genuinely miss him from the later films, no matter how wooden he can be. Okay, okay. So I’m not the biggest fan of the movie. What does work? 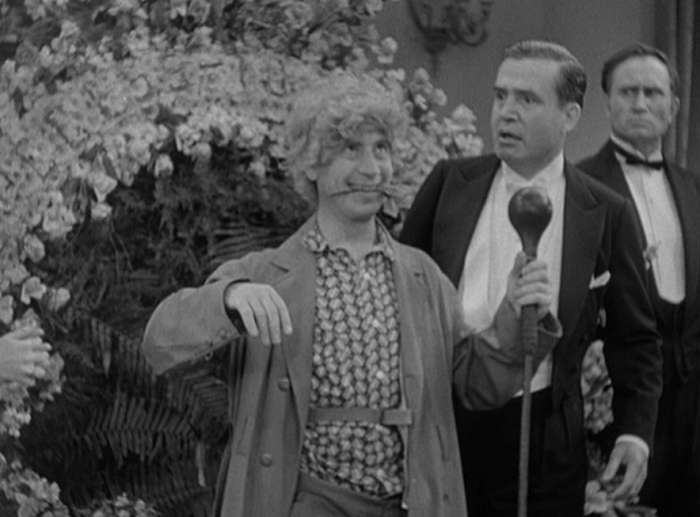 The brothers have excellent chemistry, and the romantic leads here are both fun, even if there’s no one like Margaret Dumont to lampoon. 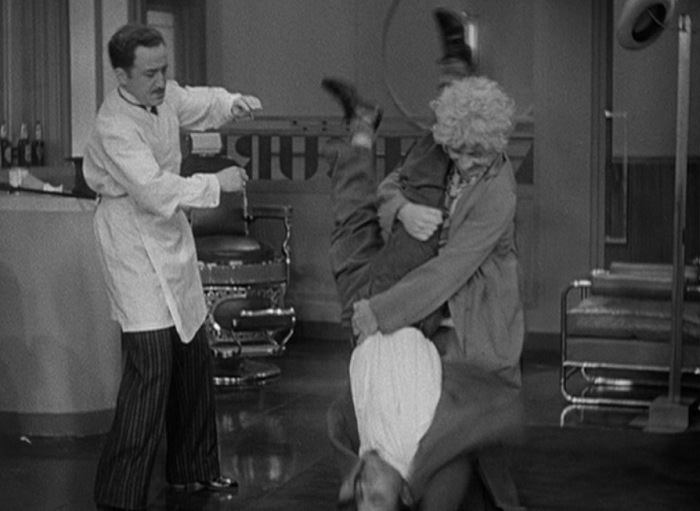 Groucho’s bits with Thelma Todd are delightful, and her special kind of manic energy seems to mesh well with his. 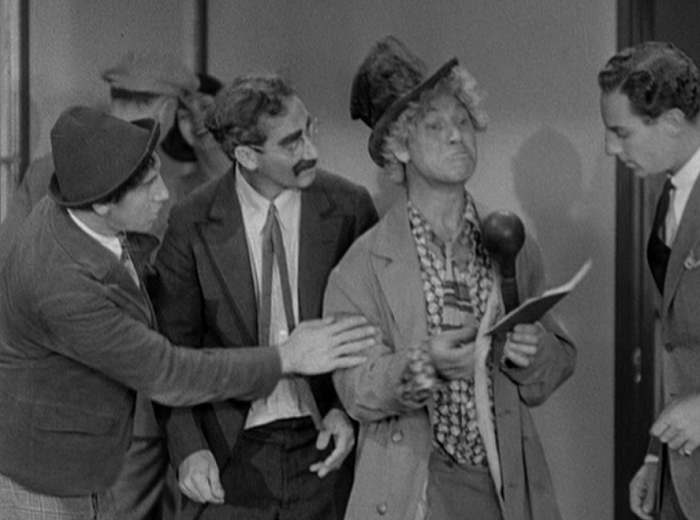 My favorite scene is as the four brothers try to get off the ship with Maurice Chevalier’s passport, where each brother takes their turn trying to recreate one of his recent songs to skeptical immigration officials. 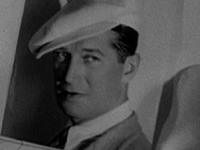 Chevalier was one of Paramount’s biggest stars at the time, and seeing the four men riff on him (albeit very horribly) is a treat. 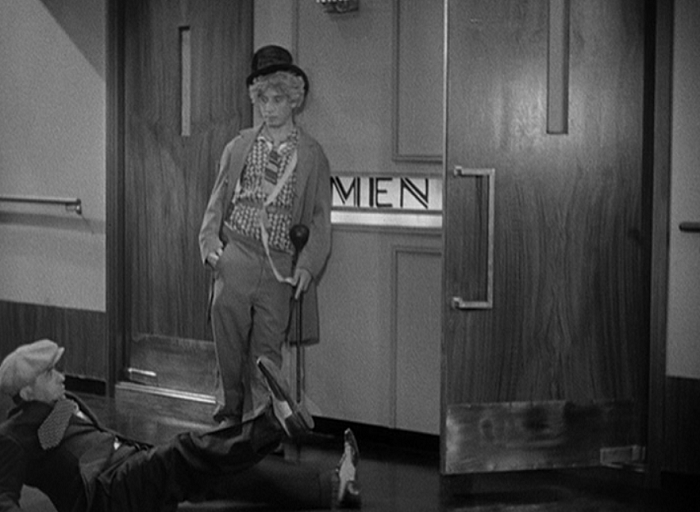 Harpo’s work in Monkey Business is some of his best. 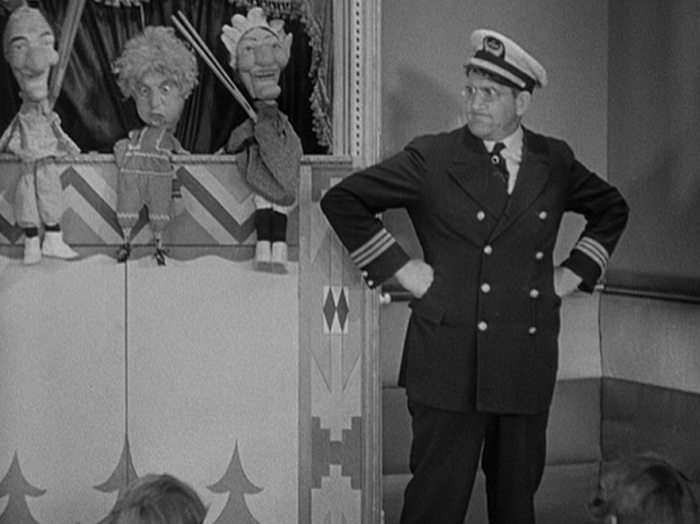 The Punch & Judy scene set on the ship is a delightful course in shifting perceptions and anarchy. Painting Harpo as the hero to children is a cute touch, and helps once again to reinforce Harpo’s persona as the eternal petulant child. But, hey, it’s not all wine and roses. 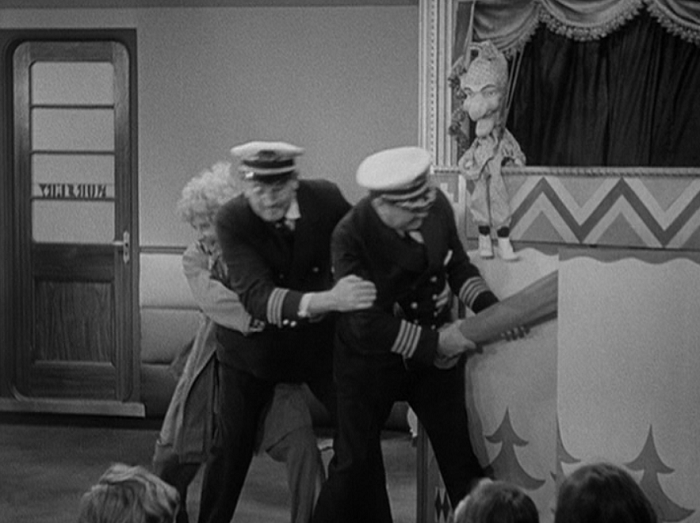 The worst feature of Monkey Business may be that the Marxes touch on stowaways again in A Night at the Opera to a much more spectacular effect. Oh, and damn if that ending is still a bear. Overall, it’s a fun movie, but it’s still lukewarm Marx. I make this facial expression all the time, even though I’m not a puppet. AFAIK. As mentioned above, the film only survives in edited versions, so anything I inevitably put here actually survived the censorship of the Production Code. 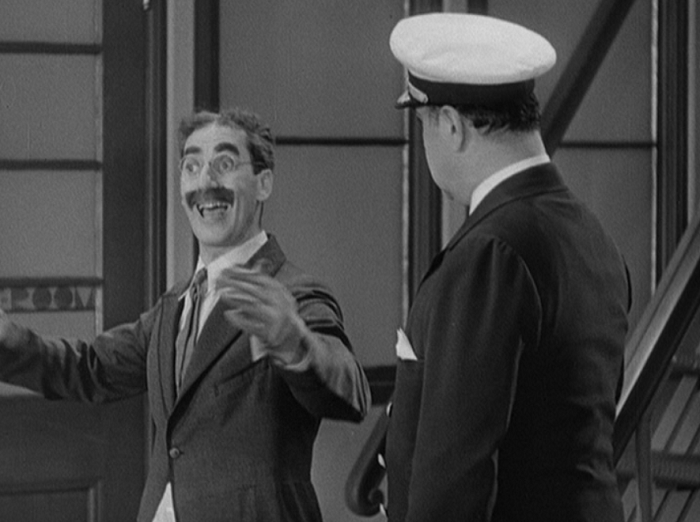 That being said, Groucho does get across some great one-liners. 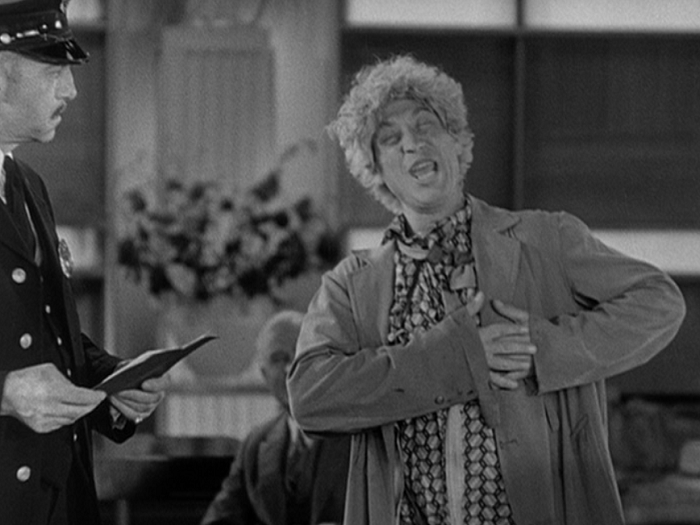 The niftiest thing I found out about this movie via The Marx Brothers Encyclopedia is that this may be the only film that the brothers made where you can hear Harpo’s voice. 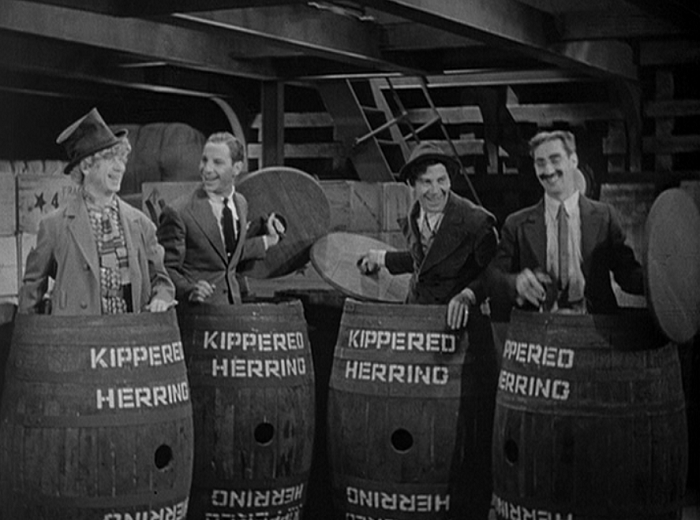 The opening a cappella number coming from the barrels contains four voices, and the song ends with a baritone that isn’t Groucho, Chico, or Zeppo’s. 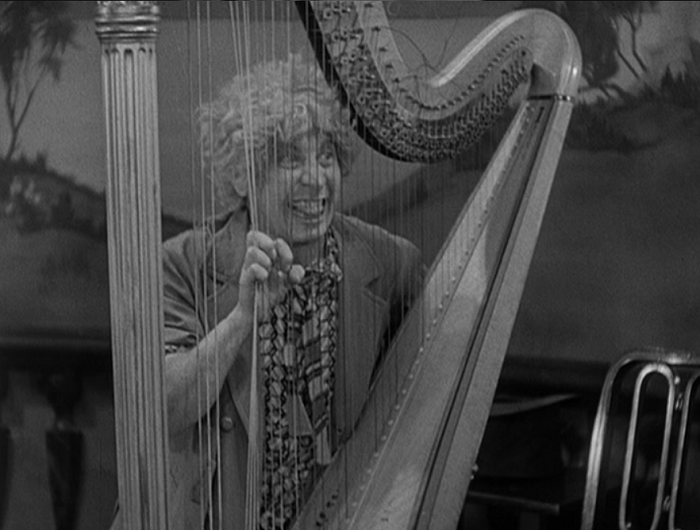 The song from Animal Crackers that Chico famously can’t finish shows up several times, with both Chico and Harpo whistling it and then later when Harpo plays it on the harp. Both manage to find a suitable ending this go around. 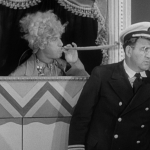 In one of those jokes that come back around, Groucho, dressed as the ship’s captain, begins to hum “The Sailor’s Hornpipe” and dance around a bit. 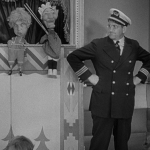 Two years later that tune would be the intro for the enormously famous Popeye cartoons, also from Paramount. 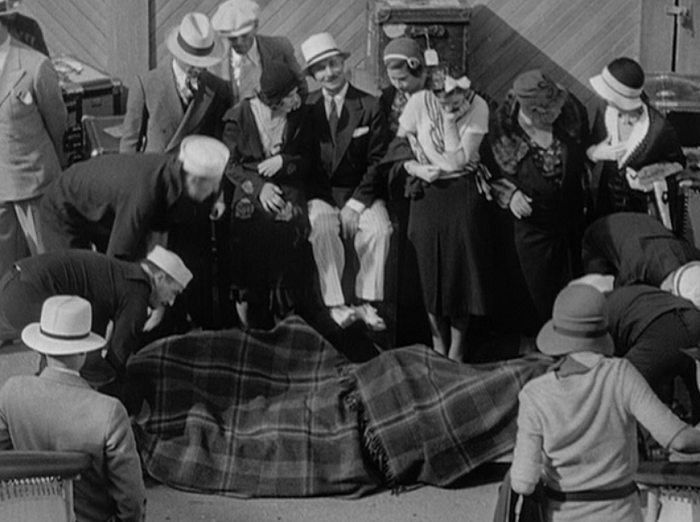 Also, the man on the crates looking at the camera in the following picture is reputed to be Sam Marx, the father of the four men about to bust out of the blanket. The vague approximation of birth imagery here also couldn’t have been a coincidence. 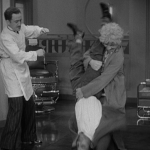 TCM’s take on the movie dives into the controversy over whether screenplay author S.J. 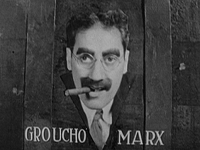 Perelman is due more credit for the Marx Brothers’ humor than Groucho would want to let on. Mythical Monkey also talks about the film’s writing, though it’s a bit more egalitarian with explaining what a hodgepodge the final result is. It sounds like we’re in agreement on the film’s pace as well. 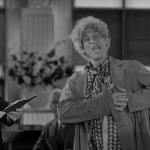 Has anyone ever pointed out how it’s funny that for the Marx Brother who doesn’t talk, Harpo always wears the loudest shirts? 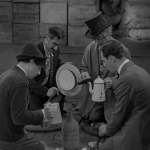 Films as Art discusses what they term as “The Marx Brothers Effect”, and espouses on what the believe the appeal of the group is, insomuch as they’re like any other group of friends whose antics are carried to the extreme. 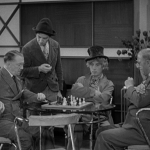 Co-star Thelma Todd appeared in 90 movies between 1930 and 1936. 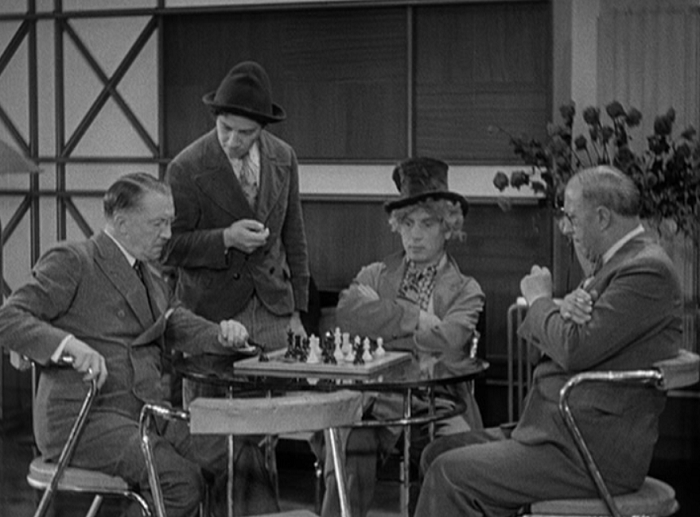 Yes, 90, and she was paired with a lot of the greats of the era, including Wheeler & Woolsey and Laurel & Hardy. 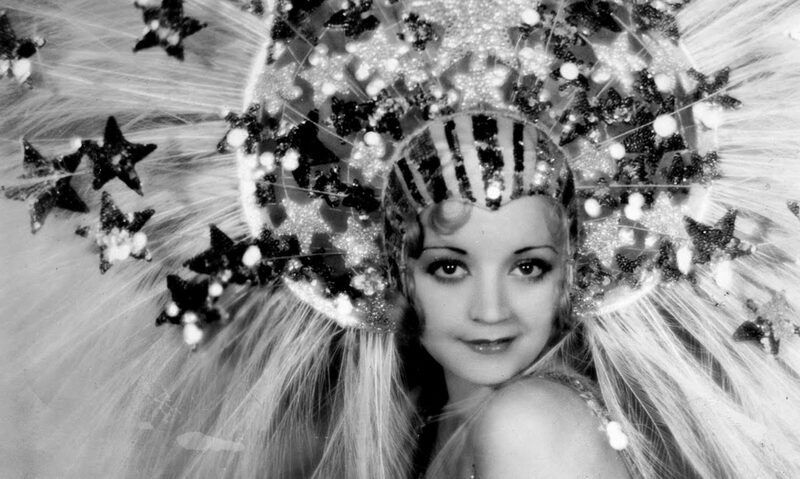 She next starred with the boys in Horse Feathers, but two years after Monkey Business was made she was found dead in her garage. It’s been debated whether this was suicide or murder, but the actual details are shady as hell. 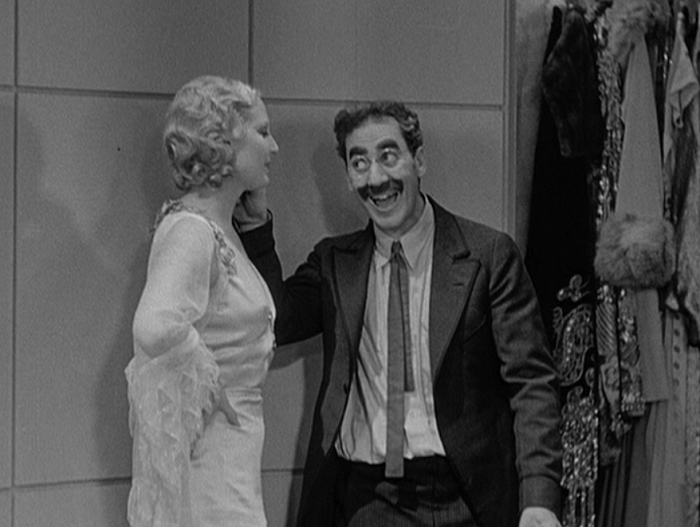 I only bring this up because Groucho makes a crack to her about leaving her in a garage all night long, and that’s now a litttttle bit awkward. 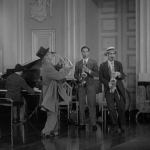 One stray observation: Before he dances with Todd in the state room, Groucho throws his cigar in the air. It doesn’t come back down. This face is how I win dumb arguments. 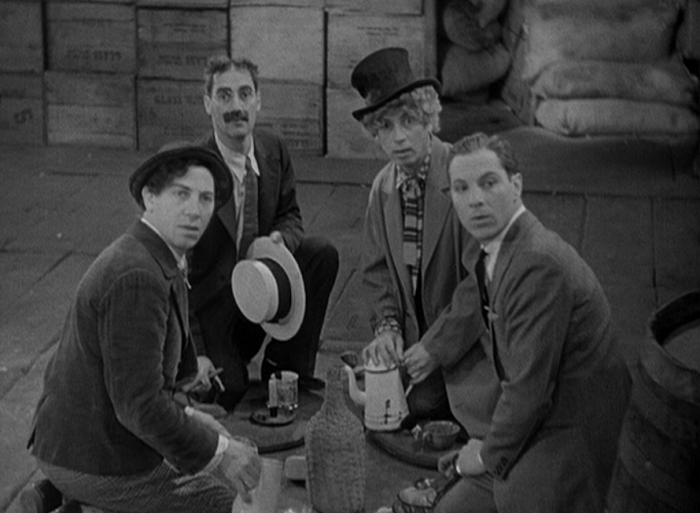 Oddly, this is the only Pre-Code Marx Brothers film not listed in the Wikipedia list of Pre-Code films.